MADDEN, Ray John, a Representative from Indiana; born in Waseca, Waseca County, Minn., February 25, 1892; attended the public schools and Sacred Heart Academy in his native city; the law department of Creighton University, Omaha, Nebr., LL.B., 1913; was admitted to the bar the same year and commenced practice in Omaha, Nebr. ; elected municipal judge of Omaha, Nebr., in 1916, resigning during the First World War to serve in the United States Navy; engaged in the practice of law in Gary, Ind. ; city comptroller of Gary 1935-1938; treasurer of Lake County, Ind., 1938-1942; delegate to every State convention since 1936; delegate to every Democratic National Convention from 1940 through 1968; elected as a Democrat to the Seventy-eighth and to the sixteen succeeding Congresses (January 3, 1943-January 3, 1977); co-chairman, Joint Committee on Organization of Congress (Eighty-ninth and Ninetieth Congresses), chairman, Committee on Rules (Ninety-third and Ninety-fourth Congresses); unsuccessful candidate for renomination in 1976 to the Ninety-fifth Congress; was a resident of Washington, D.C., until his death there on September 28, 1987; interment in Arlington National Cemetery. Ralph Nader Congress Project. 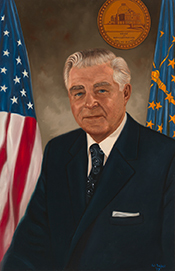 Citizens Look at Congress: Ray J. Madden, Democratic Representative from Indiana. Washington, D. C.: Grossman Publishers, 1972.